Another lovely day, sunny and bright. 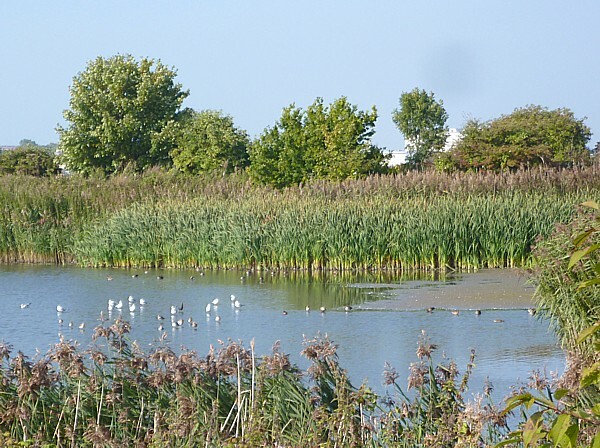 The terminus of the 464 bus is next to an open field with a river view, which is part of Shorefields Nature Park. 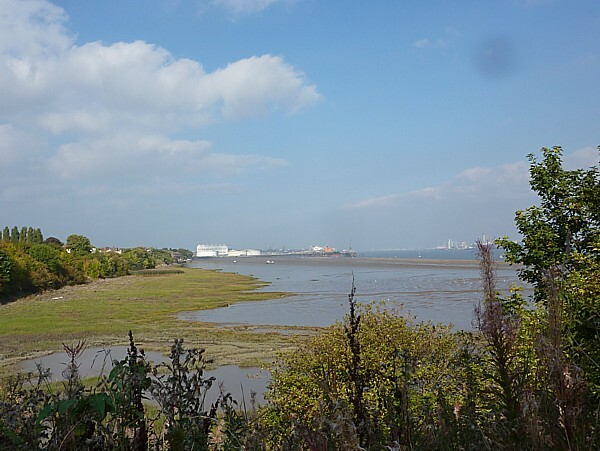 It overlooks the mud flats where the Great Eastern was broken up. 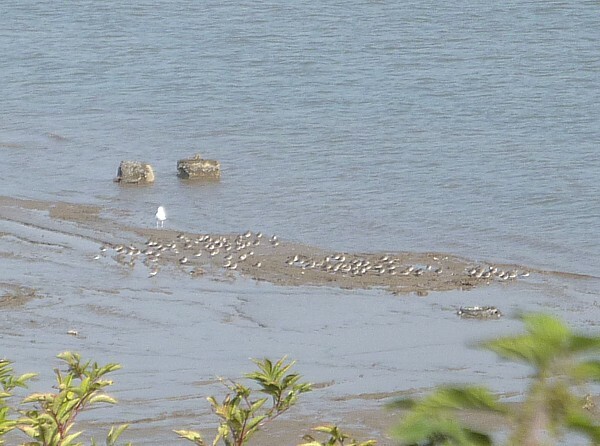 The tide was out and there were lots of birds on all that lovely mud. Black-headed gulls, Lesser Black-backs and Herring Gulls of course, and a small group of Mallards or Teal. Several Curlews were stalking about, and we heard their calls almost constantly. Two Shelduck were skimming the wet algal layer on the top of the mud. Later in the day two Herons appeared. In the field were Crows and Magpies, and a Great Spotted Woodpecker flew from one tree to another. Further along there were 50-60 Redshank with a Great Black-backed Gull keeping watch. We spotted an interesting tree right away. To the north of the open field there’s a road called Shore Bank with a row of Lombardy Poplars, and at the river end there’s an unusual and handsome dark-leaved tree that we didn’t recognise. The leaves were like Ash, but smaller, and the top surface of the leaflets was dark and glossy. The twigs were also Ash-like, but the buds were dark purple, not black as in the common Ash. There were no seeds to give us a clue. 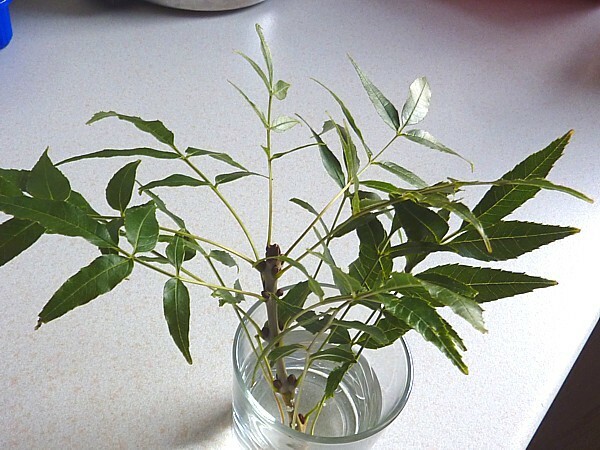 I broke off a twig to bring home and I think it’s the infrequent Narrow-leaved Ash Fraxinus angustifolia, which Mitchell (the tree expert) says is usually only found in parks in southern England. 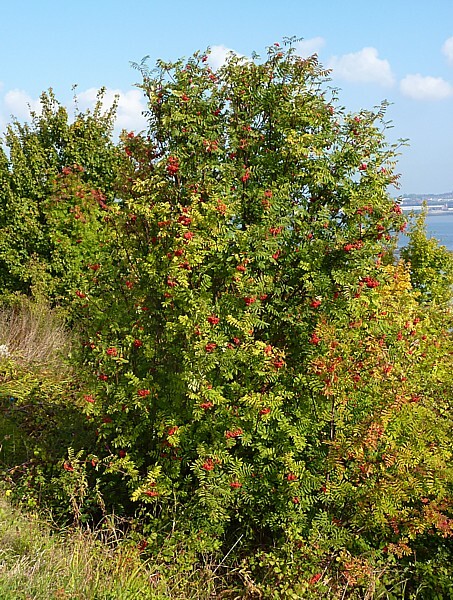 Bright red berries were everywhere. Rowan and Hawthorn, of course, and the hedgerows had Black Briony, Honeysuckle and Rose Hips. 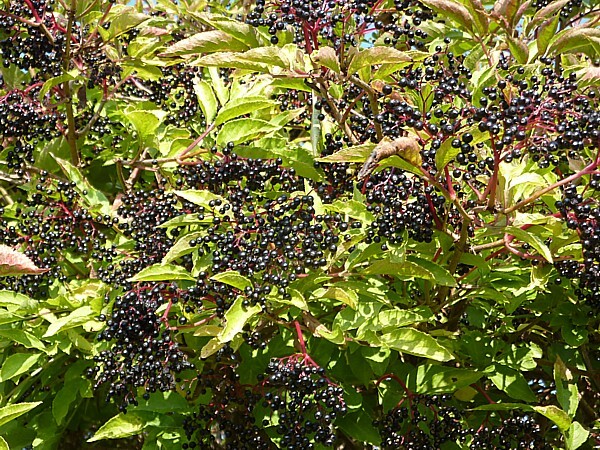 The Elder bushes were weighed down with large bunches of their black berries. At the southern end there are steps down to the shore, then another flight up into Port Sunlight River Park. The Ragwort is still in fine flower, and we also noted Red Campion, Hogweed with hoverflies, and Hedgerow Cranesbill with its dainty paired flowers. 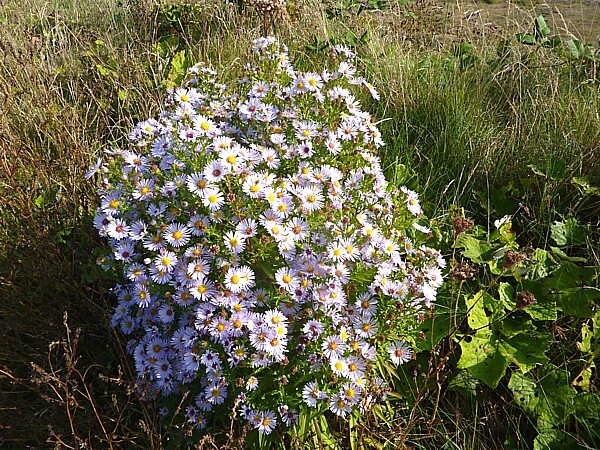 There were masses of Michaelmas Daisies. An unidentified blue dragonfly was active over the pool, and birds included Mute Swan, Moorhen, Coot, Teal, various gulls, Black-tailed Godwits, a Little Grebe and two Snipe. While we lunched near the Ranger’s office there was a Buzzard circling overhead and a hovering Kestrel. There’s a white-barked Himalayan Birch there, and in the shrubbery some gone-over roses bore unusual black hips. Then we climbed the hill, getting better views of the Buzzard. There is a sign up saying they are strimming different sections of the top each year “to maintain the meadow for wild flowers and as a nesting area for Lapwings and Skylarks”. There was at least one Skylark in residence, which we heard before we saw. Another surprising bird was a female Wheatear on the path, perhaps a bird from further north, already on migration. From the summit there are great views of Liverpool. At the very top there’s a lovely sinuous bench and an amusing wooden birdwatcher. 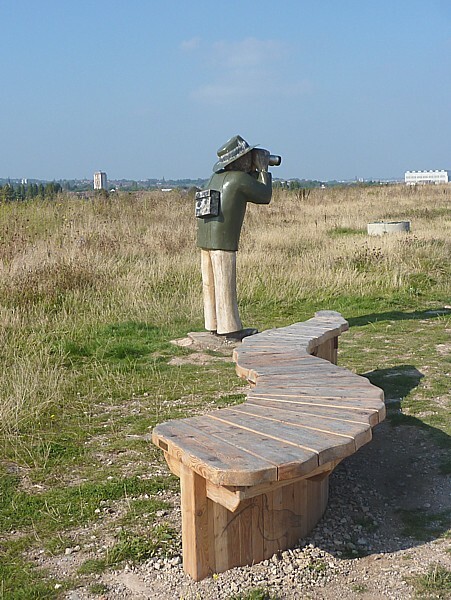 The bench is by the sculptor Mike Owens, and perhaps the birdwatcher is, too. 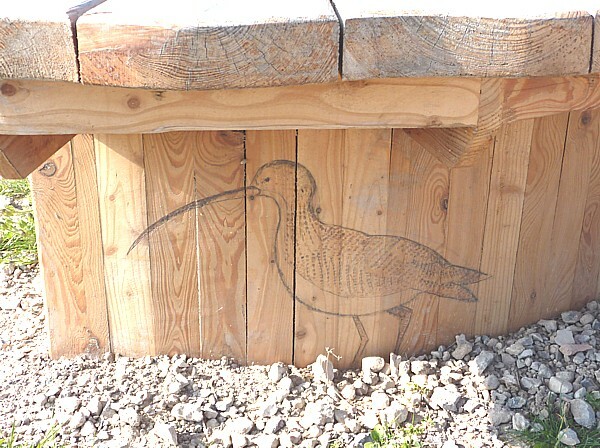 The base of the bench has drawings of local birds. It became so warm that we had to take off some layers. Not bad for October! A Large White butterfly was still on the wing, and there was a Speckled Wood in the lower hedgerows. A Teasel head was covered with the fluff from Rosebay Willow Herb seeds. The commoner trees were also heavy with seeds. 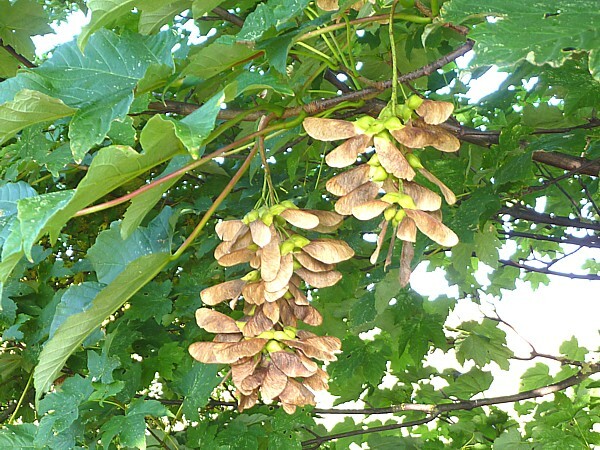 Great bunches of Ash keys are still on the trees, and this Sycamore bore seeds with the wings at quite a wide angle, more than the “regulation” 90 degrees and almost as wide as those of Norway Maple, but it was definitely a Sycamore. Many of the trees we saw from the bus today were taking on their autumn colours, but turning unevenly on the same tree. 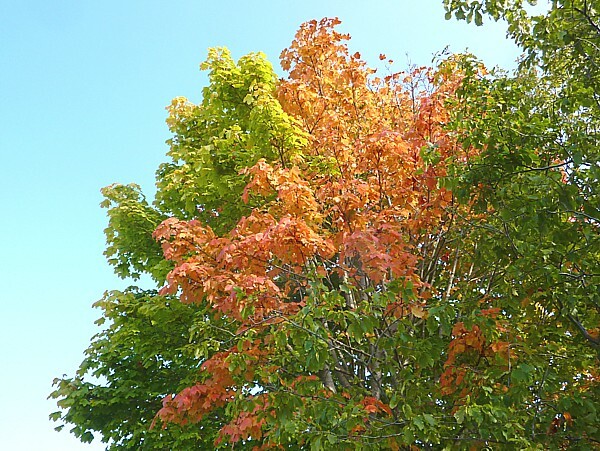 One branch might still have green leaves, while another has turned a glorious colour. I don’t remember seeing that to such a degree in previous years. 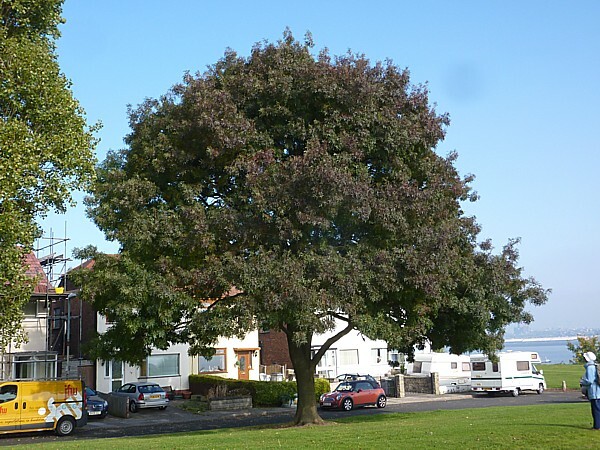 Here’s a Maple from near the houses on Shorefields. Twice on the bus journey home I was startled to catch glimpses of trees with wholly yellow foliage, but I couldn’t stop to check what they were. They were probably Golden Ash Fraxinus excelsior ‘Jaspidea’. 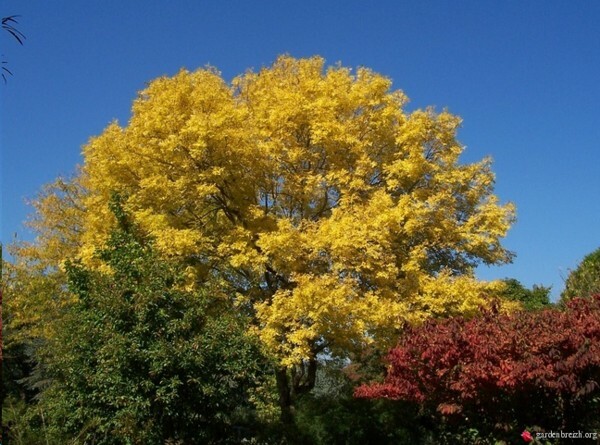 One tree nursery’s blurb describes it as “An eye-catching tree, with glorious, long lasting, butter yellow autumn colours in mid to late October.” Here’s a picture of one in Nantes Arboretum, courtesy of the French GardenBreizh website. By the way, remember that grafted and broken Willow-leaved Pear in Princes Park a few weeks ago? 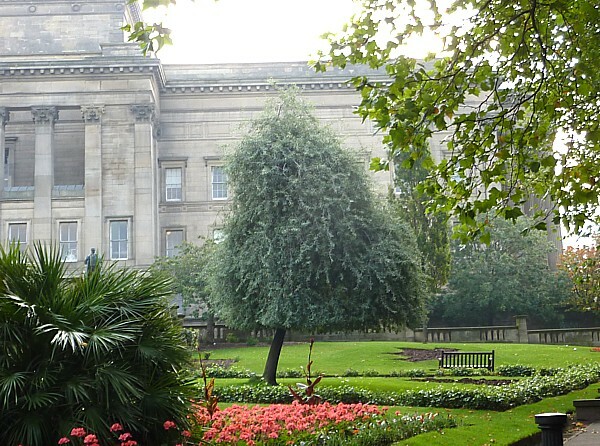 There’s a pair of far better-looking ones in St John’s Gardens in Liverpool, one on the Central Library side and one opposite the Marriott Hotel.